During the years my younger daughter lived in London, I “smuggled” Sriracha sauce in my suitcase for her at every visit. It just wasn’t a product she could find in London. I always double-bagged the 28-ounce plastic bottle with sealable bags. Can you imagine if 28 ounces of hot sauce exploded in your suitcase?!! On Amazon.com, the 28-ounce bottle of Sriracha can be purchased for $3.74. And imagine how long that bottle will last? Well, everyone except for my daughter who puts it on everything, any time of day. It’s an inexpensive addiction, at least. My mother recently sent me The Sriracha Cookbook just for fun! The author is Chef Randy Clemens, and his book was published in 2011. In the introduction, Chef Clemens tells the lengthy story of the over 30-year history of this now ubiquitous “rooster” sauce. It was originally a Thai product. David Tran, born in Vietnam of Chinese decent, brought it to American after being forcibly moved for political reasons. Once settled in Chinatown in Los Angeles, he started Huy Fong Foods, and in 1983 created Tu’o’ng Ó’t Sriracha. The familiar rooster on the squeeze bottle represents the year of Tran’s birth on the Chinese zodiac. Being that Sriracha is more of a seasoning than an ingredient, I was a little skeptical about the originality of the cookbook’s recipes. I mean, I think we’ve all squirted some Sriracha into mayo or pho for some zing. But the recipes are overall unique, and definitely embrace spicy foods, which my whole family enjoys – especially my Sriracha addict! I chose to make a spicy Sriracha Gazpacho from the cookbook. 2 green onions, white and green parts, sliced diagonally, for garnish. In a large nonreactive mixing bowl, combine the puree with the onion, yellow and green bell peppers, celery, cucumbers, jalapeños, garlic, parsley, cilantro, Sriracha, lemon juice, and oil. Season with salt and pepper to taste. 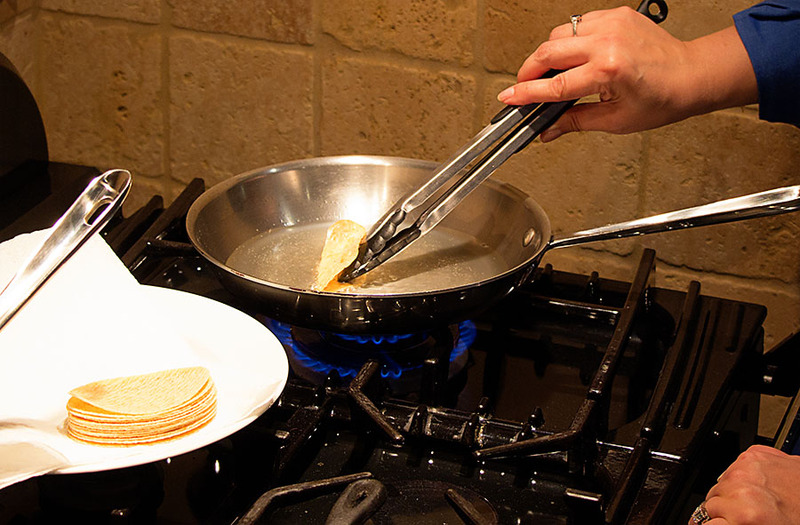 Refrigerate for at least 2 hours or until ready to use, to allow the flavors to marry. 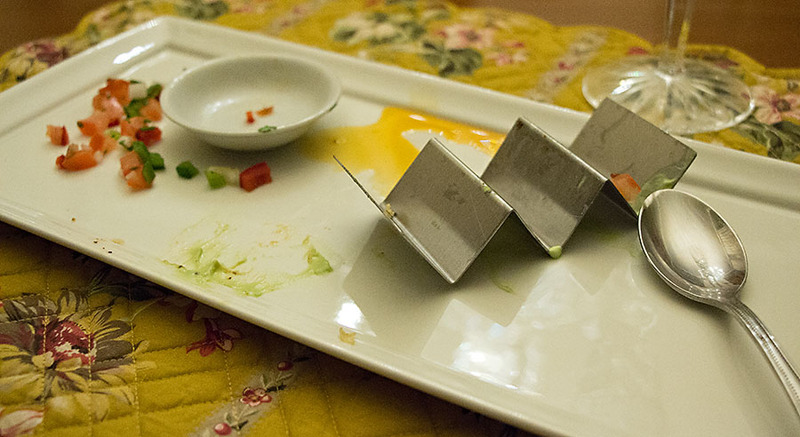 Ladle into soup bowls and garnish with the avocado slices and a squiggle of Sriracha. Top with the green onions, and finish it off with a friendly drizzle of olive oil. note 1: I made a smaller batch, but I respected the ratio of ingredients. note 2: I used a regular cucumber, de-seeded. note 3: I used lime juice instead of lemon juice. note 4: I didn’t use a green bell pepper because I am not fond of them. verdict: I absolutely loved this gazpacho! Even the next day it was delicious. The whole soup could easily be made in a food processor, but I decided I liked the texture of the bits of vegetables. Next time I wouldn’t change a thing! 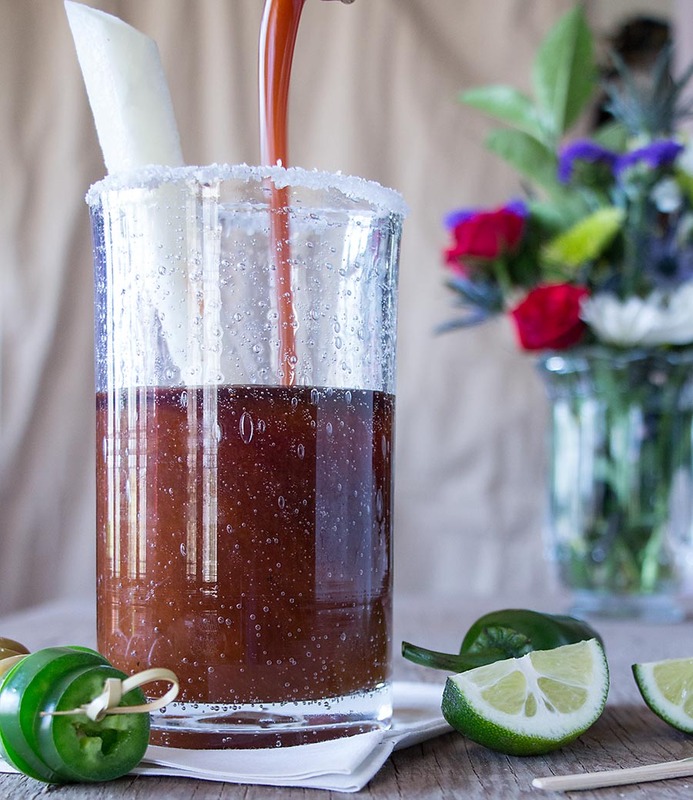 As I mentioned in my post yesterday, I was inspired to make an ancho chile pepper infused vodka, by the discovery of Ancho Reyes, an ancho chile liqueur. I wasn’t inspired to make a chile pepper liqueur, but a vodka, on the other hand, was really intriguing to me. I proceeded to make the ancho, chipotle, and coffee flavored vodka, and waited one week. It was finally time for the unveiling. The vodka has a beautiful reddish-brown color to it, and had a nice chile pepper aroma. 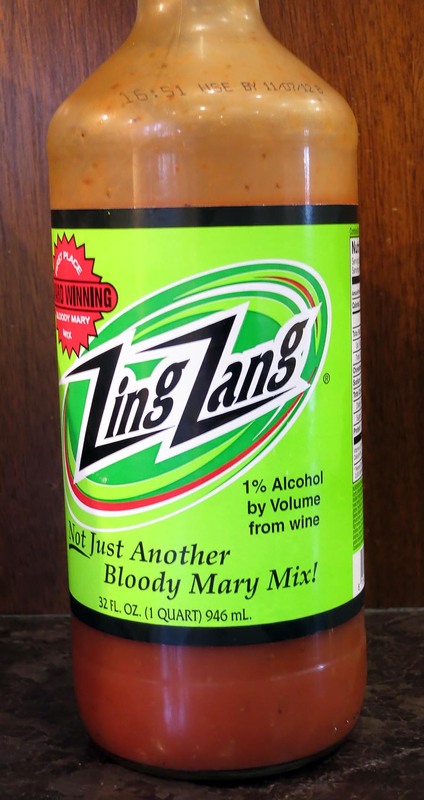 I decided to keep things simple, and just mix this home-made vodka with a bloody Mary mix I enjoy, which is called Zing Zang. Run a slice of lime over the rim of the glass. 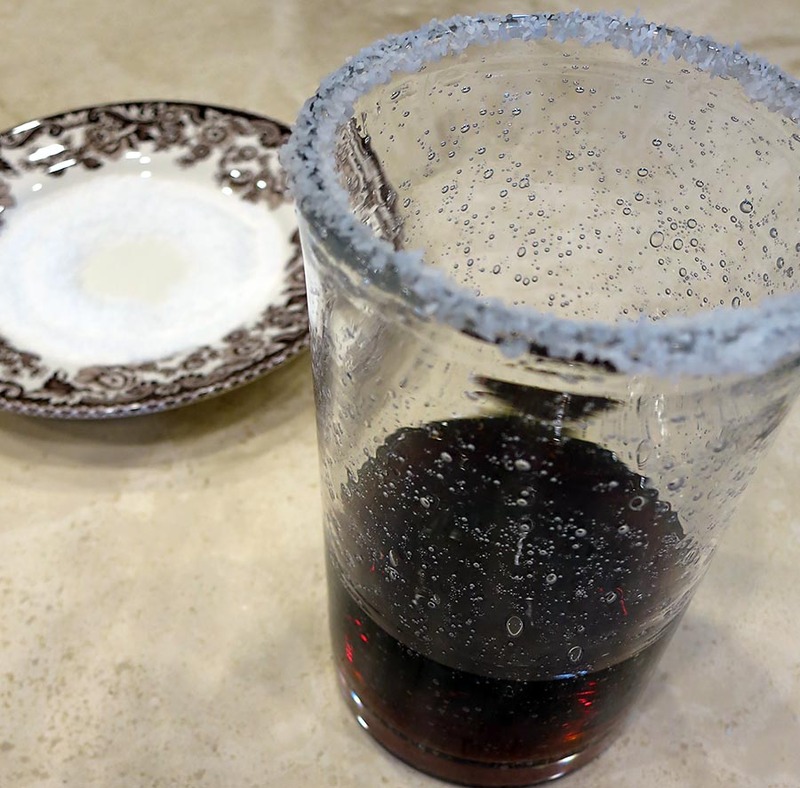 Sprinkle some salt in a small plate, and dip the top of the glass into the salt. 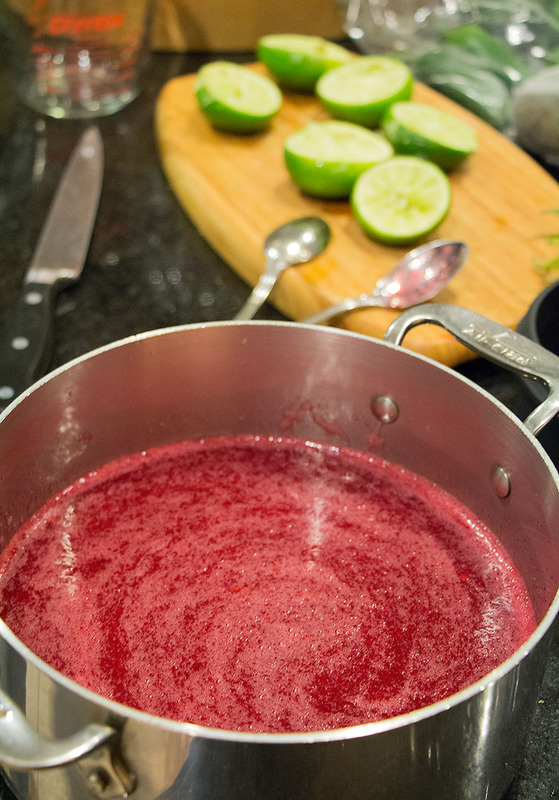 Then add your preferred amount of the ancho-infused vodka. 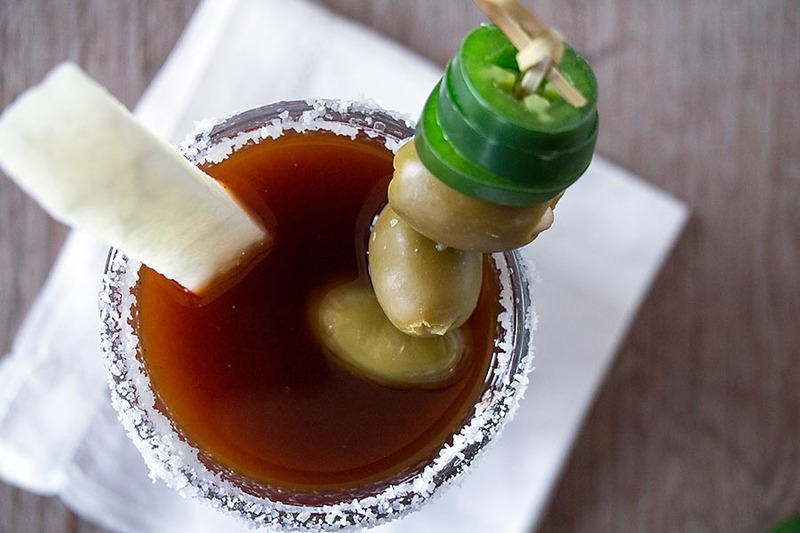 Fill up the rest of the glass with the chilled bloody Mary mix. Actually, if you prefer, you can include ice before you begin making the drink. For fun, I added a spear of jicama. 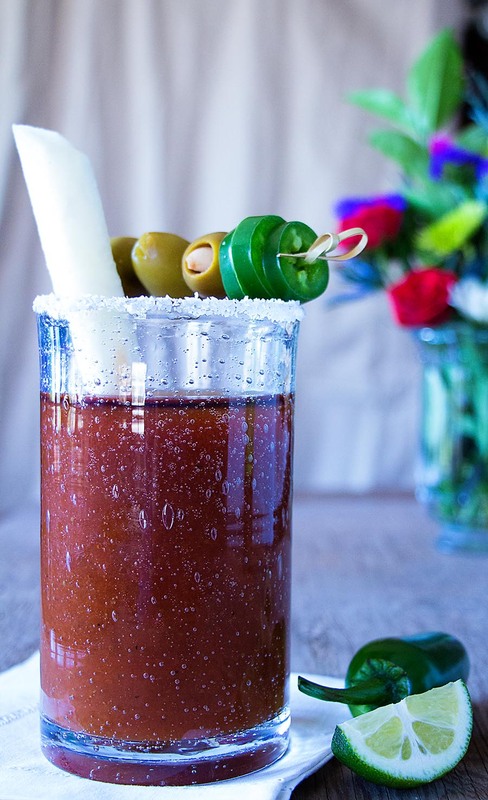 As well as a few jalapeno slices and garlic-stuffed olives. verdict: This was a surprisingly successful vodka experiment! 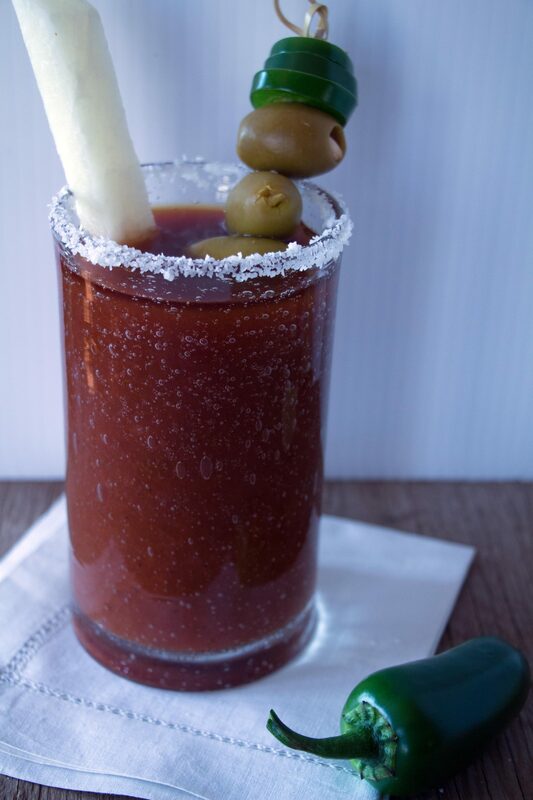 The bloody Mary was fabulous. The next time I might add two more chipotle peppers, and definitely include coffee beans. Unfortunately, I can’t think of any other drink that this vodka would be good in, but perhaps some of you have some suggestions? On March 1st, just a few weeks ago, I drove to Dallas, Texas, for a special occasion. 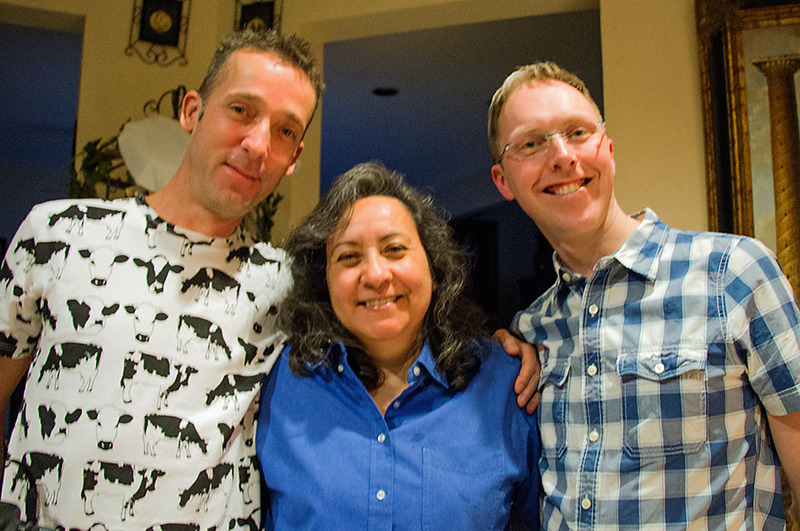 My Dutch blogger friend Stefan, from Stefan Gourmet, was visiting our mutual blogger friend Richard, from REM Cooks. For me, it was barely 24 hours, but it’s a visit I will never forget. 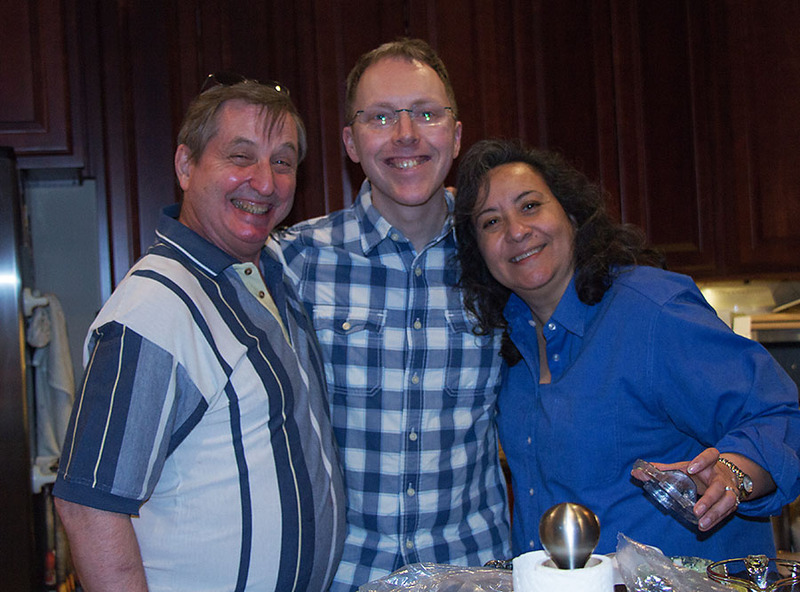 Of course, there was fabulous food and wine, and non-stop conversation, but the camaraderie was genuine and lively. It was really special meeting these two other bloggers, both of whom I’ve been following since I began blogging myself about 1 1/2 years ago. There were just so many questions to ask each other, and so many food-related issues to discuss. 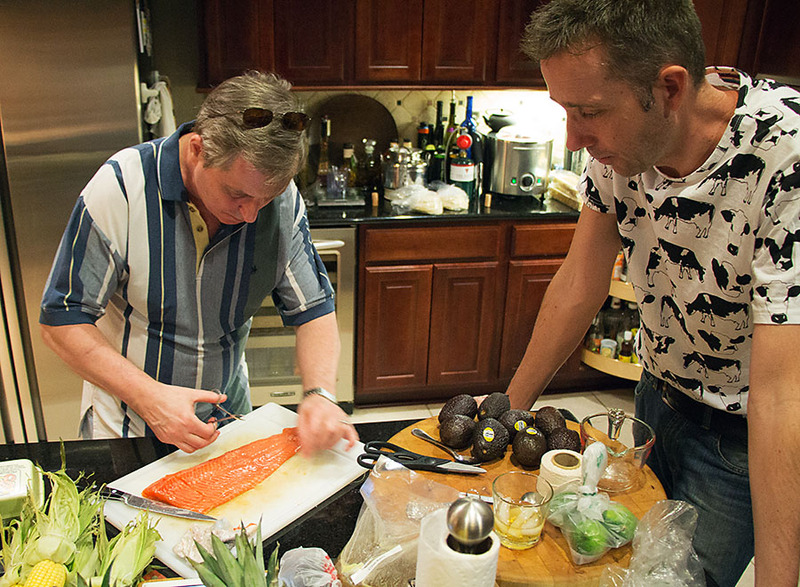 In fact, I’m not sure if I’ve ever talked food so much before – especially with two men! After dealing with unsuspected traffic, I reached Richard’s beautiful home by 5 PM, and finally got to meet Stefan and his husband Kees, pronounced case, as well as Richard, who is the larger-than-life Texan you expect him to be. The infamous “Baby Lady,” otherwise known by her real name, Elia, or Richard’s wife, was at a grocery store when I arrived. 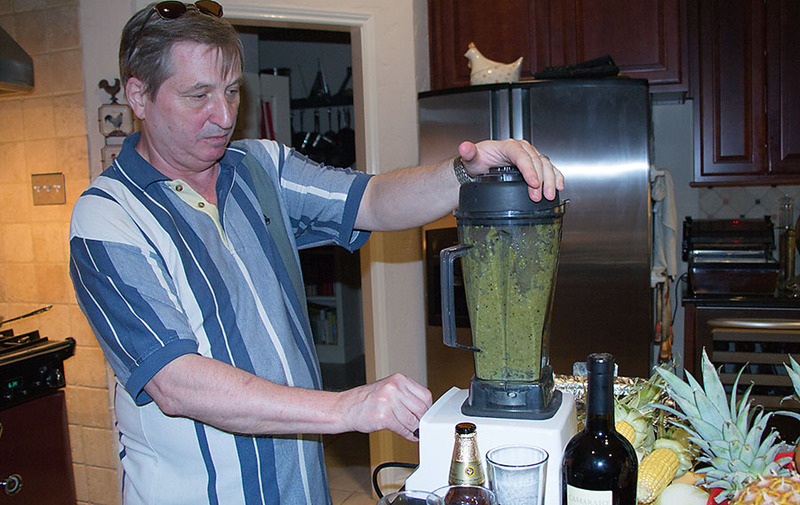 If any of you aren’t aware, Richard’s specialties in the kitchen are Mexican and Southwestern cuisines. He had originally wanted to become a chef as a young man, but had been persuaded otherwise by his father. So Richard is a lawyer by day, and gourmet chef the rest of the time. Richard is a huge chile pepper afficionado, and is well known in blogger circles as single handedly changing the course of food history in Ireland and Holland! He sent chile pepper care packages to Stefan and also Conor Bofin, who lives in Dublin. You can read about the “chile challenge” here on Stefan’s blog. It still makes me laugh out loud when I think of Irish Conor and Dutch Stefan opening up the box containing 7 varieties of chile peppers, plus some other chile pepper goodies, having probably never seen anything like them at their local markets before! 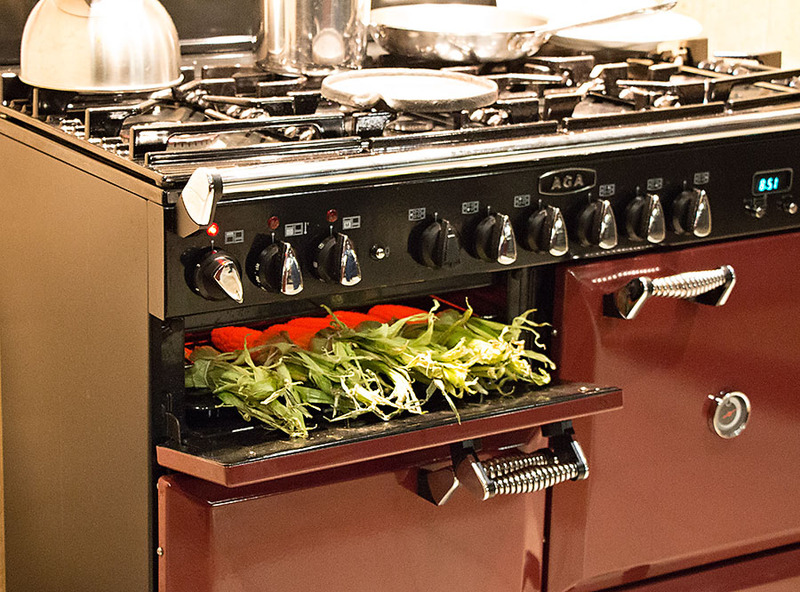 One highlight for me during my visit was witnessing the use of a serious Aga stove. I’ve only seen the ones with the flat tops, but this guy has 8 burners and 4 ovens. The dinner Richard planned for that evening was involved, not surprisingly, and there were many elements required. I meant to take a little notepad with me on this visit, knowing I would want to write everything down, but I managed to forget it. It’s embarrassing to not have everything documented, and not remember the name of every single element that was prepared that evening, but I can tell you that it was all spectacular. Both salmon, swordfish, and tuna were prepared for the meal. 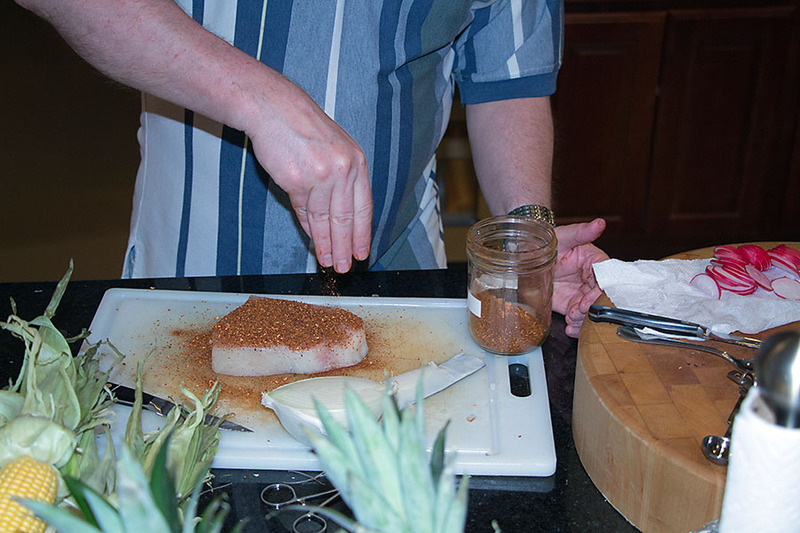 The swordfish is being seasoned with Richard’s famous ancho chile rub. I could tell that Richard and his wife cook together, because they had a real natural rhythm. 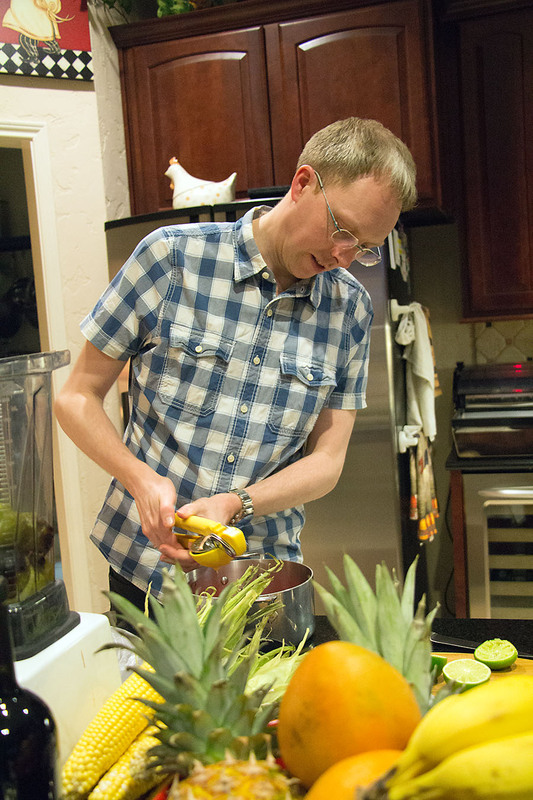 Richard, with some help from Stefan and Elia, prepared a prickly pear mixture for the dessert sorbet. Stefan, a true gentleman, was willing to help in any way, including refilling my wine glass. Elia peeled the prickly pears, and told me that it’s easy to hurt your hands from the cactus needles that remain in the skins, so I let the expert do the prep work! 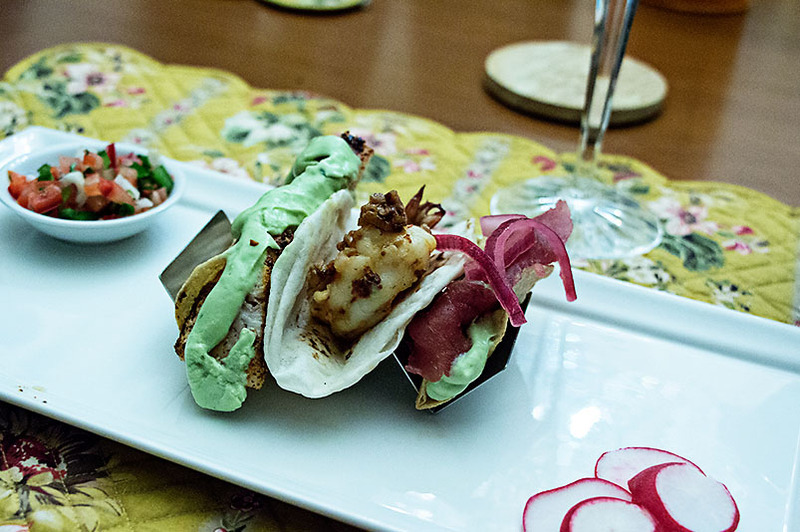 The first course was a salmon ceviche, and a mini taco trio – fresh bigeye tuna (sushi style) with avocado cream and lime pickled red onions; ancho crusted, seared swordfish with avocado cream and pico de gallo; and shrimp tacos al mojo de ajo (with garlic salsa). I can honestly say that I’ve never seen these little metal contraptions that held up the tacos. What will they think of next?!!! 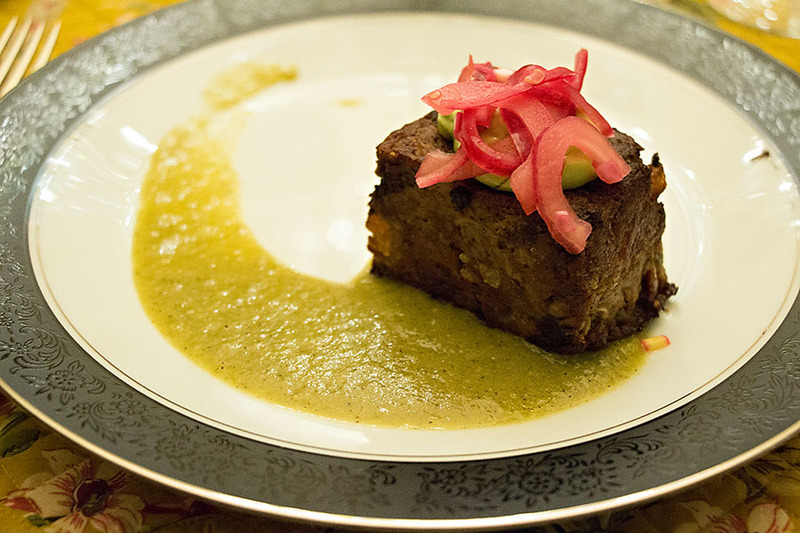 And then, a second course, was Duck carnitas (carnitas de pato) with radishes, avocado cream, pico de gallo and lime pickled red onions. Dessert was red prickly pear fruit sorbet, or Sorbete de tuna rona. It never got photographed by myself, and I can probably blame too much wine on that. It was served with champagne, and I can tell you that it was delicious and refreshing. 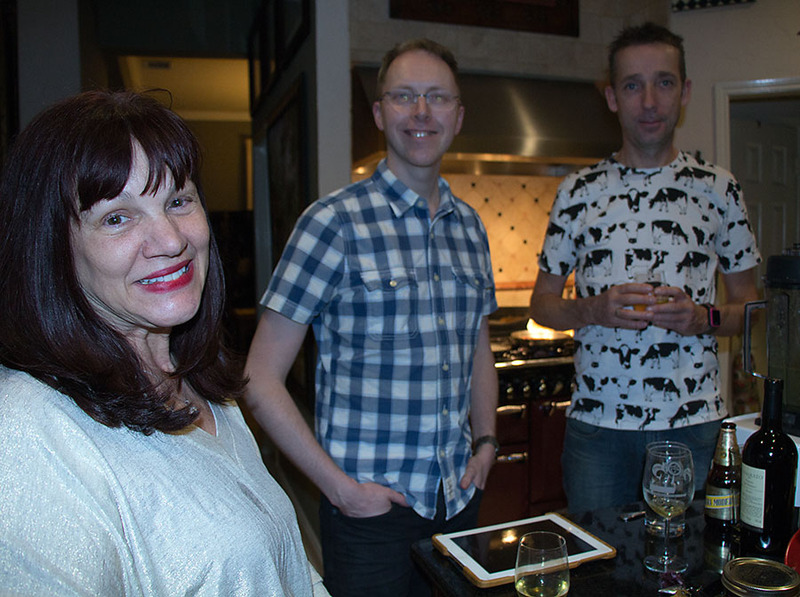 The next morning was spent on more food-related conversations, and then Richard and Elia put out a fabulous cheese platter and poured Sauterne. Unfortunately it started sleeting outside, so I had to bid my goodbyes and leaver sooner than anticipated. But all-in-all it was a delightful visit, and I feel very blessed to have been allowed in to these two families. Maybe one day we can all meet up again!